Profit at Melco Resorts and Entertainment Ltd plummeted 91.7 percent year-on-year in the third quarter, the company said in a Thursday statement. Such profit was US$9.60 million, compared to nearly US$115.9 million in the prior-year period. As of January this year, the firm adopted a new accounting standard, so the two sets of numbers were not strictly comparable, noted the firm. Melco Resorts operates casinos in Macau and Manila. Net revenue for the third quarter 2018 was US$1.2 billion, down 11.4 percent from nearly US$1.4 billion for the comparable period in 2017. But there was a special item in the third quarter, namely what the firm called a “one-time special gift granted to non-management employees”. It did not quantify the aggregate amount of the payment in its quarterly accounts, although general and administrative costs rose 32.1 percent during the period, to US$146.56 million. In August, Melco Resorts had announced it would give a “one-time special gift of one month’s salary to eligible Macau non-management employees” in relation to a new pension fund plan. It was not clear from Thursday’s results announcement if that was the “gift” being referred to, as the latter had been payable at the end of October, outside the third-quarter reporting period, the firm had said in August. But Lawrence Ho Yau Lung, chairman and chief executive of Melco Resorts, did clarify on a Thursday conference call with analysts that the payment related to the firm’s “pension plan”. As of December 31 last year, Melco Resorts had 14,715 employees in Macau according to its 2017 annual report published in April this year, and further 4,894 in the Philippines operation. Mr Ho was asked during the call with analysts to clarify whether the “one-time special gift” for Macau-based workers mentioned in the third-quarter earnings was likely to be a recurring cost in following years. He said only that he would consult with other Macau casino operators to get their views on the matter, implying there was likely to be pressure on the whole industry to make some similar payments to their Macau workforces. In terms of group operations, many of Melco Resorts’ third-quarter indicators were down year-on-year, even allowing for the new accounting standard. Operating income slipped 56.6 percent to US$83.6 million in the three months to September 30, from US$192.7 million a year earlier. Casino revenue fell 19.9 percent year-on-year, to just under US$1.03 billion in the July to September period, from US$1.29 billion. “VIP has fallen faster than we had expected,” said Mr Ho on the conference call, making reference also to “macro” factors affecting Chinese consumer confidence amid the United States-China “trade war”. The average spend per premium-mass customer “is not what it was,” added Mr Ho, although he said the firm was positive about the base mass and slot business segments. The group’s adjusted property earnings before interest, taxation, depreciation and amortisation (EBITDA) fell 26.2 percent in the three months to September 30, to just under US$295.4 million, from US$400.2 million in the prior-year period. “While reported net EBITDA … was considerably lower than consensus … the adjusted third-quarter number was not nearly as bad as the headline,” said Japanese brokerage Nomura in a Thursday note. “Adjusting for low VIP hold, one-time employee bonuses, and typhoon impact in Macau, we estimate the normalised third-quarter number was closer to US$345 million (US$365 million if mass hold normalises),” wrote analysts Harry Curtis, Daniel Adam and Brian Dobson. The latter was a reference to disruption caused by Typhoon Mangkhut, which led to Macau imposing a precautionary closure of all casinos. Notwithstanding key numbers going south, the firm decided to declare another quarterly dividend of US$0.14505 per American depositary share (ADS). The board also approved a new US$500-million share repurchase programme, “effective immediately”. Melco Resorts said that year to date, the company had also repurchased approximately 23 million ADSs, worth approximately US$490 million, under a US$500-million share repurchase scheme the company had announced in March. Digging deeper into the individual property numbers for the third quarter, Melco Resorts said in its filing to Nasdaq that at City of Dreams Macau (pictured) adjusted EBITDA declined 40 percent year-on-year to US$147 million, “primarily a result of poorer performance in the rolling chip segment” and a “one-time special gift granted to non-management employees”. Net revenue at City of Dreams was US$600.9 million compared to US$715.9 million in the third quarter of 2017. Rolling chip volume at the property totalled US$12.3 billion for the third quarter 2018 versus US$11.2 billion a year earlier. The rolling chip win rate however was 2.4 percent, versus 3.5 percent in the third quarter of 2017. Studio City’s adjusted EBITDA declined 7 percent year-on-year to US$89 million, “primarily as a result” of the so-called “one-time special gift” to non-management people. 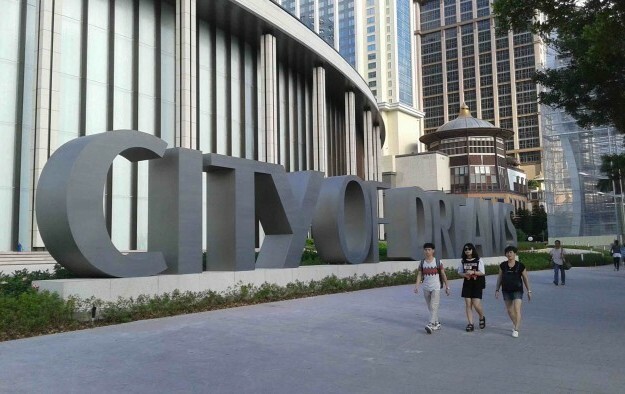 At City of Dreams Manila, a Philippine casino operated by Melco Resorts, adjusted EBITDA was US$55.2 million, 3.7 percent down on the US$57.3 million achieved in the comparable period of 2017. In common with several other Macau operators that had recently announced third-quarter earnings, Melco Resorts gave some more details on its remaining infrastructure expansion plans in the Macau market under its existing gaming concession. Aside from the ongoing remodelling of hotel accommodation at City of Dreams Macau extending into 2019, Mr Ho said Studio City phase two would include a “12,000-square-metre [129,167 sq foot] water park” as well as two extra hotel towers with an aggregate extra 940 rooms. Geoff Davis, the group’s chief financial officer, mentioned on the earnings call the capital budget would be US$1.4 billion. Mr Ho said the timetable was tight. “We need to finish it by July 2021,” he stated, alluding to the Macau government’s time extension granted to the firm – majority owner of Studio City – on the deadline for development of the phase two land parcel. In addition, Melco Resorts’ current Macau casino rights expire in 2022. “Low hold in VIP, and City of Dreams continuing to be plagued by low hold added to the underperformance,” stated analysts Vitaly Umansky, Eunice Lee and Kelsey Zhu.